And again we are made worthy by God to be festive and celebrate the great Despotic Feast of Christmas, or the birth of Christ, which celebrates the Second Person of the Holy Trinity who assumed human nature, became the God-man and was born among men to free us from the dominion of sin, the devil and death. 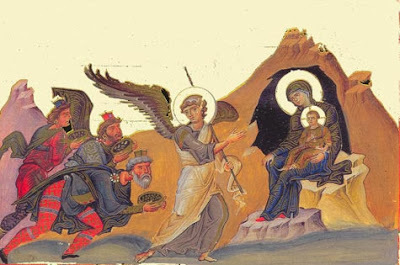 We again see all of creation glorify the newborn Christ, as we chant triumphantly in the Kontakion of Saint Romanos the Melodist: "Angels with the Shepherds glorify Him, Magi with the Star journey to Him." The center of all creation is Christ, who is glorified by it, and He illuminates all and everything. Among those who were made worthy to worship the newborn Christ and whom we remember every Christmas are the Magi of the east who saw the Star, understood that a great event took place, and they followed it to reach Bethlehem to place their gifts before Christ - gold, frankincense and myrrh. Indeed, the Fathers saw symbolism in these gifts, since gold is a royal color, frankincense signifies divinity, and myrrh signifies death, and so the Magi honor Christ as King, God and as One who suffers and rises. The Magi, according to Herodotus, were the special priestly race of the Medes. Later, among the eastern peoples, the term "magi" referred to wise men, teachers, priests, physicians, astrologers, seers, and interpreters of dreams. At that time, astrology was associated with astronomy, and for this reason we can say moreover that the Magi were the astronomers of their day who observed the starry skies. Generally, the Magi were wise men, scientists, and so in their person the wise ones venerated the newborn Christ. The Magi, as the Fathers teach us, were made worthy to recognize Christ and to worship Him "through the knowledge of the mind", and having internal purity they were made worthy of this great theophany. We believe, therefore, that all ways of the life of man receive special value and importance from the relationship they have with Christ. Throughout the centuries we meet this dual mentality: wise men and scientists who believe in Christ, as well as magicians and astrologers who resist Christ. As can be seen, the crux of the matter lies in what is the center of reference. From this center all things receive their value and meaning. We do not reject anything, provided that they have a center, a goal, and do not object to Christ. When creation, science and wisdom according to the world operate within their own space, without denying their faith in Christ, they are not a waste, but to the contrary they are a gift and blessing from God. Who does not honor a medical scientist dealing with human health? Who does not recognize the value of different scholars concerned with the advancement of science, and their presence is in varying degrees and ways beneficial to people? 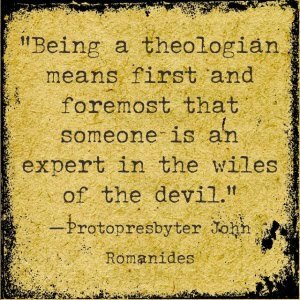 But when people do different tricks and, according to the words of the Apostle Paul, use deception and intrigue, and are enemies of justice, then this cannot be accepted by the Church. Our age is filled with such atypical magicians seeking to mislead people, who are enemies of justice, and market hunger and misery, as well as the hope of the people. Sometimes such people, who have the characteristics mentioned above, and seek to pervert the paths of the Lord and deceive people, enter also into the intimate areas of the Church. For there are prophets and apostles who follow the teachings of the Church, and heal with love for mankind, and then there are false prophets and false apostles who mislead people and care for their own social standing, despite the people. Our Christian Mysteries, as Saint Gregory the Theologian says, are not the "sacrificial art of Magi, and their entrail forebodings" (Oration 39:5), but a true sacrifice to the living God. We should not only view enemies as being outside the Church, but they are also within it and among us. There are those who do not have Christ as the center of their lives, but rather themselves, and they deceive people, disappoint them and charm them, that is, they try to captivate people with their charm. They do not seek the glory of God, but their own glory; they do not intend to serve people, but exploit the faith and hopes and aspirations of the people for their own benefit. The case of the Three Magi who worshipped Christ and offered their gifts to Him is to be a model for us, to have Christ as the center of our lives and offer Him our gifts and wisdom, and acknowledge Him as King, as God and as the One crucified and risen for us. This, besides giving meaning to our lives, will also benefit people. Anyone who believes in Christ, cannot be unjust and exploit people, as several modern magicians do, but to the contrary they would sacrifice their lives for them. Beloved brethren, let us journey with the Magi and the Star towards Bethlehem that we may worship Christ and serve with sincerity and love the people of Christ, and people all over the world. Let us listen to the words of Saint Gregory the Theologian: "Run with the Star, and bear your Gifts with the Magi, gold and frankincense and myrrh, as to a King, and to God, and to One Who is dead for you" (Oration 38:17). Source: Ekklesiastiki Paremvasi, "Μάγοι και μάγοι", December 2006. Translated by John Sanidopoulos.